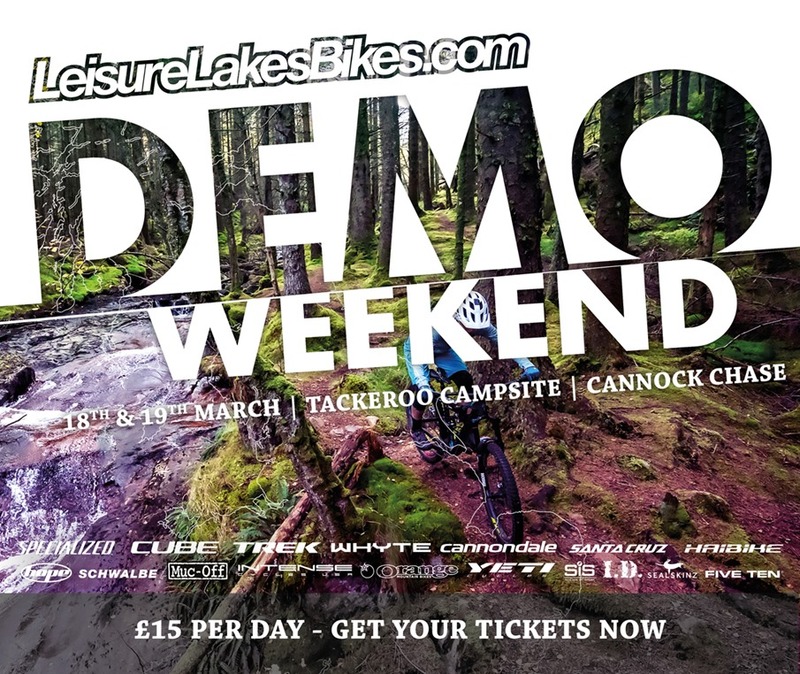 It’s that time of year again… our 2017 Demo Weekend is back and will be hitting Cannock Chase on 18th-19th March! This is our most anticipated event on the year and we are proud to hold the largest mountain bike demo in the UK! This year we have over 180 bikes from the top brands available to test on the trails of Cannock Chase as well as a range of clothing and accessories to test out along side bikes, giving you a great opportunity to get back to back testing of the latest kit. £5 of every ticket sold goes to Birmingham Children’ Hospital - This year we have chosen the Birmingham Children's Hospital as our Charity of choice who need donations to help 250,000 children each year. £5 of every ticket sold will go to the Midlands Air Ambulance Charity - These people are invaluable to us when we need them most. We wanted to give something back to the people that have helped so many mountain bikers in their time of need over the years. Our demo weekend sells out very quickly and tickets are in very high demand. To stop people reserving tickets for friends that may not be able to make it, which then means other people miss out, we wanted to add some commitment to tickets so everyone gets a chance to come to our demo. We have a huge demo fleet that will be available on the weekend and we have a full list of the demo weekend bikes below showing sizes available from the brands below so you can get your wishlist ready! Ladies demo bikes will also be available at our demo weekend and we will have a ladies ride run by Specialized each day at 1pm – check out more information and how to join us! All bikes are available on a first come, first served basis on each day. Not only that, we also have some clothing and accessory brands that will have kit available for you to test out on the trails; an opportunity you rarely get! Please be aware that you will need a form of photo ID (see below), a debit/credit card, a helmet and a pair of pedals to test any of the bikes on demo over the weekend. We do not charge your card for anything but we will need to keep hold of your Photo ID and credit/debit card whilst you are testing bikes for security reasons. Please note you will need all of the above to be able to demo a bike! Are there ID requirements for the event? Is there an age limit for the Demo Weekend? People of all ages are welcome to the event, however you must be over the age of 16 to demo an adult bike. Please note if you are under the age of 18 and don't have a valid bank card you can use a parent's bank card/ID to demo bikes. There is FREE parking available on-site for our demo weekend. Please arrive at Tackeroo Campsite in plenty of time and keep an eye out for our stewards who will advise where to park. Debit/Credit Card - Must match your photo ID. We will not charge your card. Pedals - We highly recommend you bring your own pedals to demo the bikes available over the weekend. We will have some pedals for you to use but you will be much more comfortable using your own pedals as you can get a real feel for the bike. Can we camp/stay at the event? Unfortunately there is no camping allowed on the ground for the demo weekend. However there is a wide choice of hotels nearby if you are coming for both days and need somewhere to stay! Yes! If you contact beth@leisurelakesbikes.com we can transfer your ticket to someone else. Yes, simply head to www.eventbrite.co.uk and log in. You can then amend any of your ticket information for the event on your account. Yes, please bring your ticket with you on the day; this can either be printed or on your mobile phone. If you can no longer make the event please let us know by Thursday 17th March and we can issue you a full refund. Any cancellations after this date can not be refunded. By registering for a ticket you agree to our conditions of registration. If your ticket is registered under a different name you must sign the conditions of our Demo when you arrive at the event.